It's 8am and time to get moving. 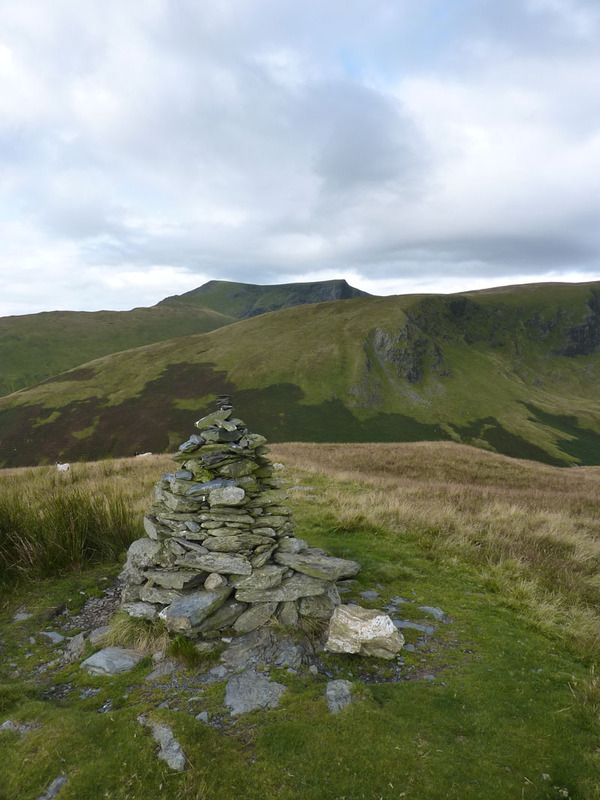 The first target is Souther Fell (Wainwright suggests "Souter") and don't pay too much heed to his route up this fell from the village. A farmer says no access through the field, so there's a detour along the road, this allows for a gentler ascent and you get a longer walk, which for fellwalkers can't be too bad. Part way up and a look back at the village. It's clouding over, the sky having been clear further east and south on the way up. 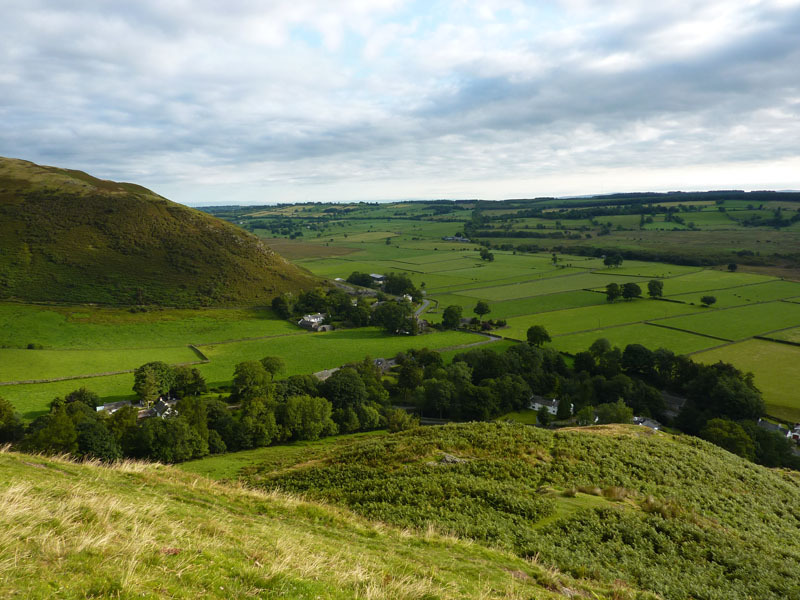 Putting aside the pronunciation of the fell's name; the map reveals that it points fairly much in a southerly direction, so its name may actually be quite appropriate. The bump on the right is Great Mell Fell. This confirms the point I made about the weather - it's not as dark as this, the camera is on auto-setting and until I read the instructions, this is how it is. Looking South-West reveals some well-known bumps, see if you can name them. AW recounts the tale of "The Spectral Army of Soutra Fell", refer to your copy of Book Five. I don't think it's credible, too far-fethced for my liking. 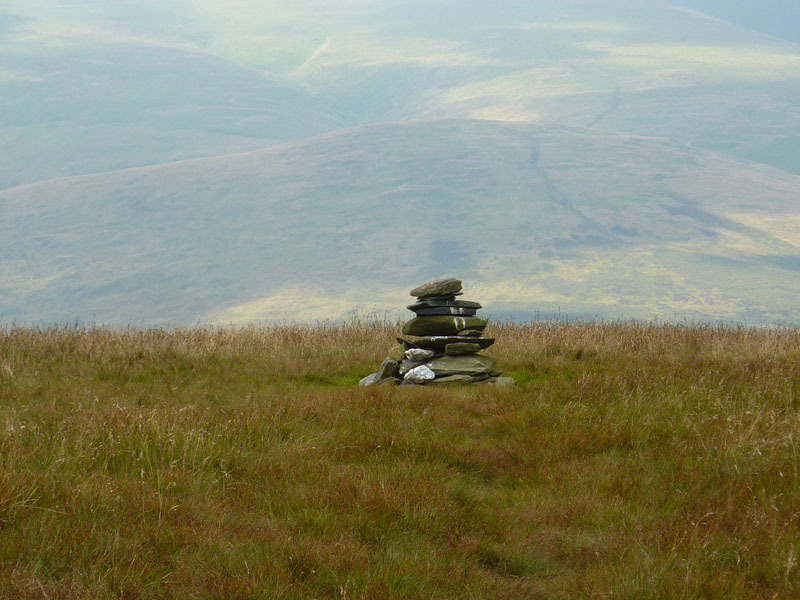 Cairn builders have put their only effort in the vicinity in the wrong place - this is not the summit. 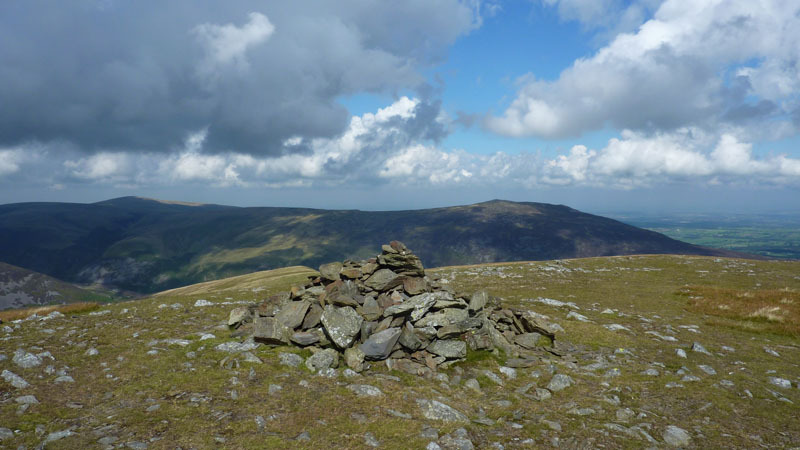 But their ploy has worked, just about everyone will walk across to see the cairn and wonder why it is here. And take a photograph. "Moosthwet Cooom" - that's the last time I'm going to have a go at trying to say how it should be said. 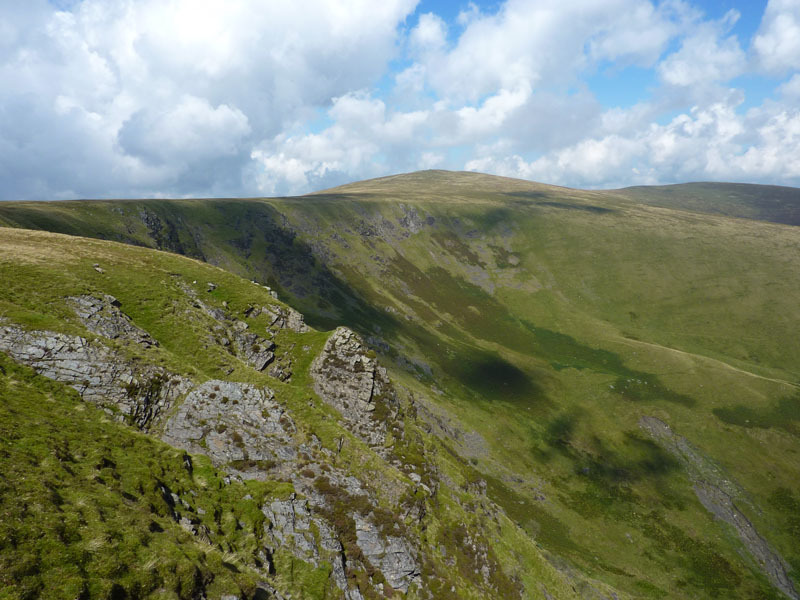 My walk plan was simple, go across the Combe and then take a route quite directly up Bannerdale Crags (on the right). But I was distracted and the simple nine mile walk plan was in jeopardy. 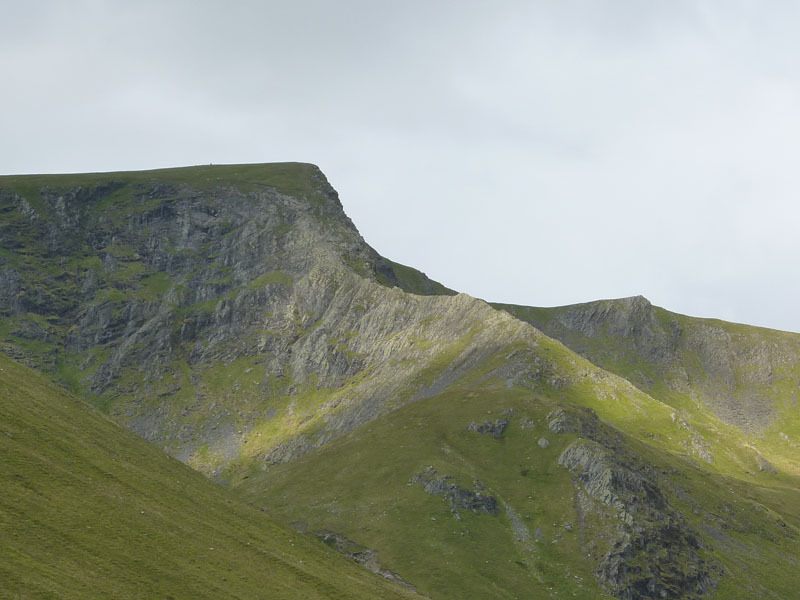 Drawn to the Edge, like steel to a magnet, I couldn't resist my second climb of Sharp Edge, the first being about 25 years ago. It's dry and there's not much wind about, so it should be straightforward. 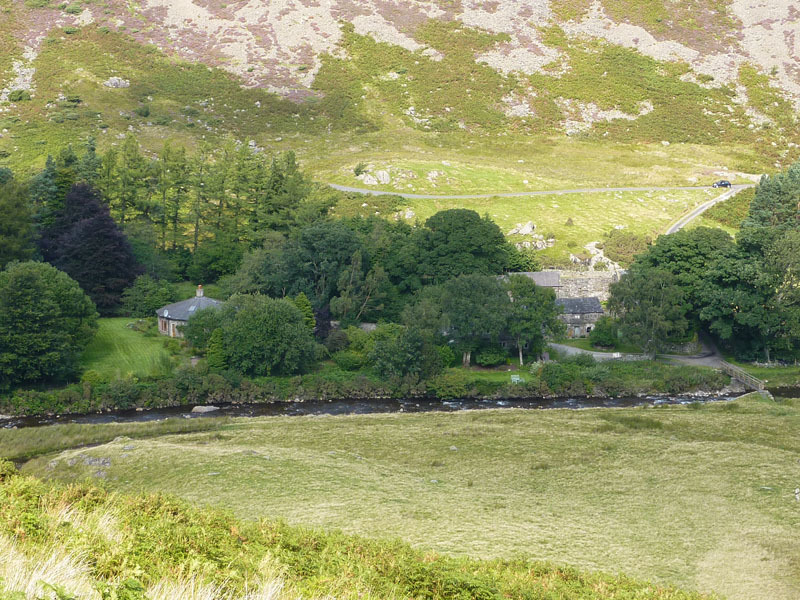 I made my way along the footpath west of the infant Glenderamackin and up Scales Beck to the tarn. Time on my side, I took a wander around the water's edge. 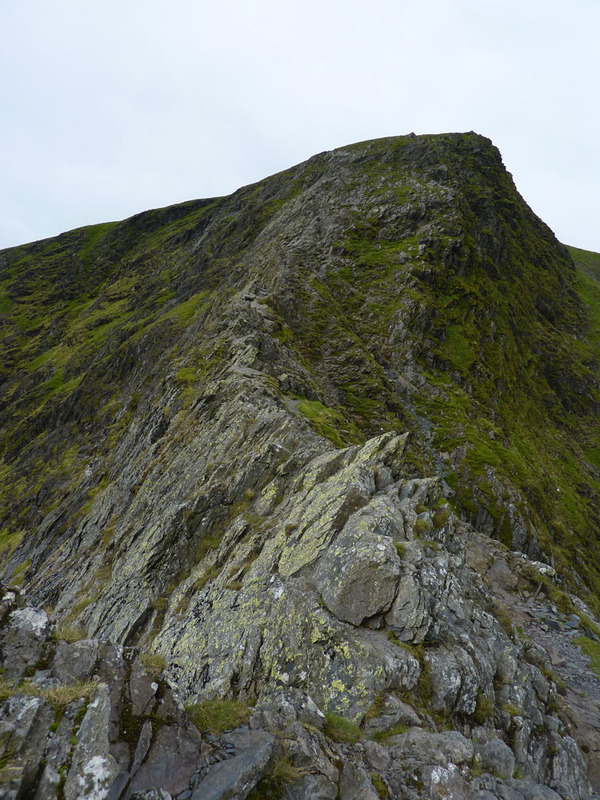 Then it was best foot forward to Sharp Edge. 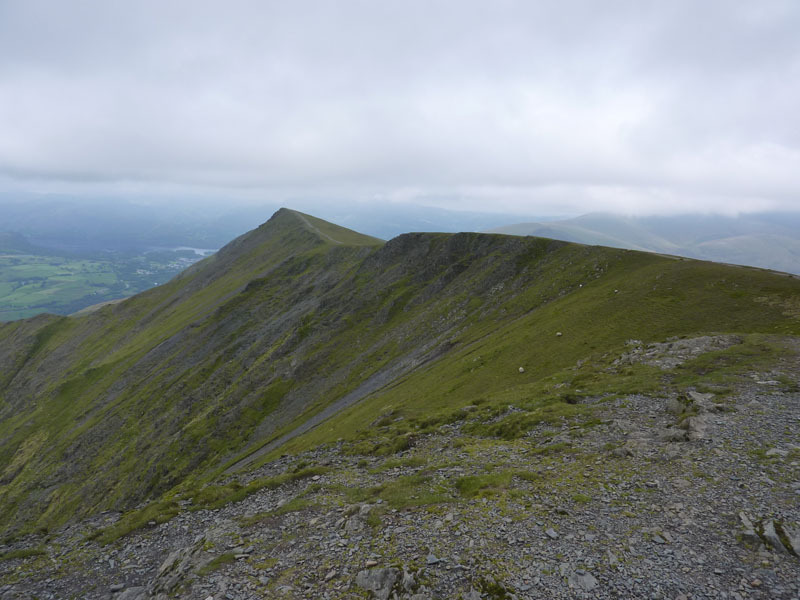 I've often seen great photos of Sharp Edge, but these are not in that category, this was the cloudiest part of the day; grey rocks with grey sky are not making it happen. I had no difficulty on the Edge; I know it's a different matter when it's wet or icy and I'm sure it's easier going up than coming down. 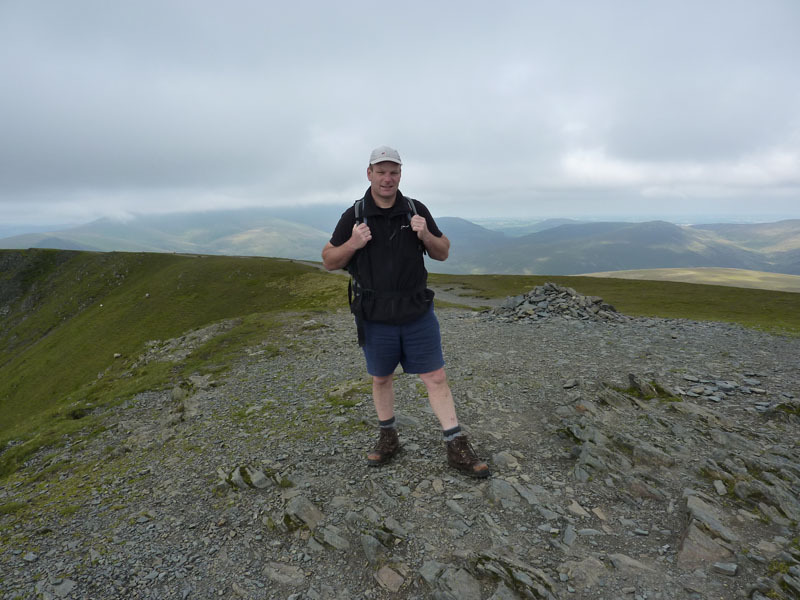 I can honestly say I had no intention of climbing Blencathra today, it's just one of those unexpected things. 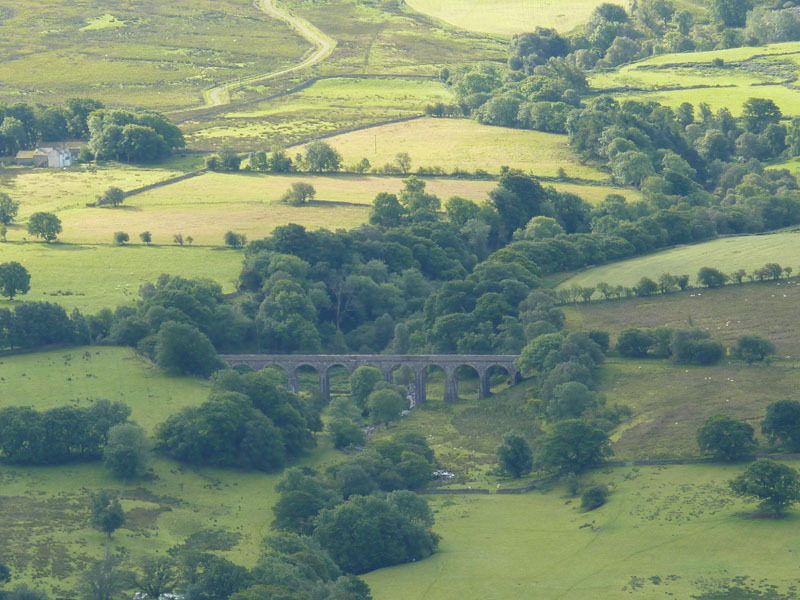 This photo was taken by fellwalker Ron from Durham. 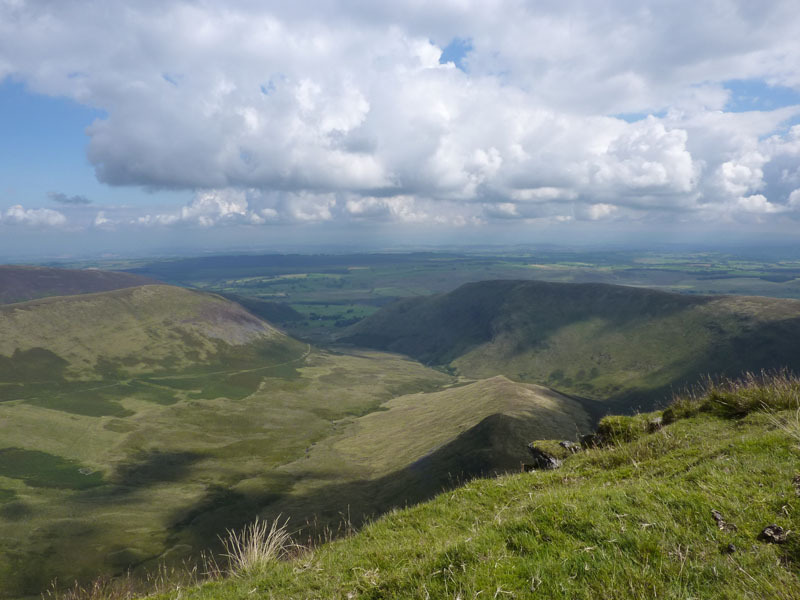 I met a few other walkers up here, Hall's Fell being the popular ascent route. 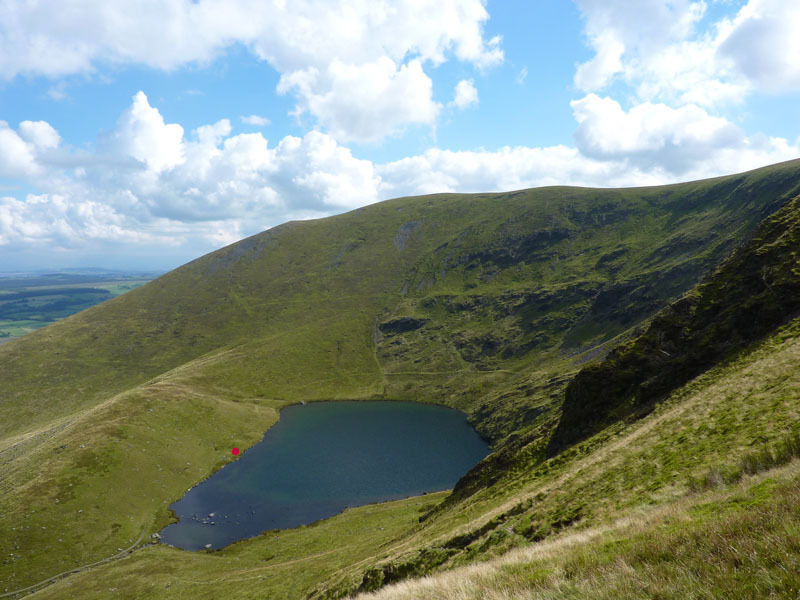 Just here I met another keen fellwalker who needed to add Mungrisdale Common to her list of summits and then leave three more before completing her round. 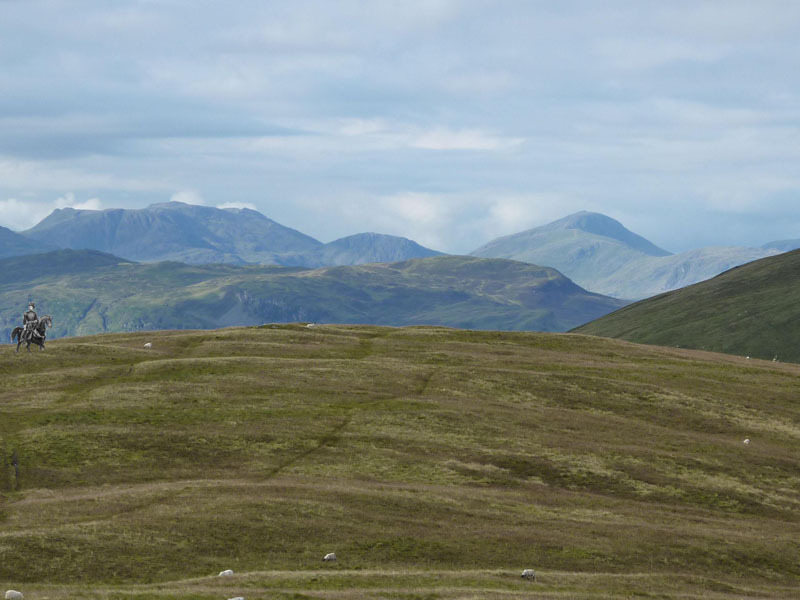 We walked off towards MC, one of Lakeland's less appealing fell tops. 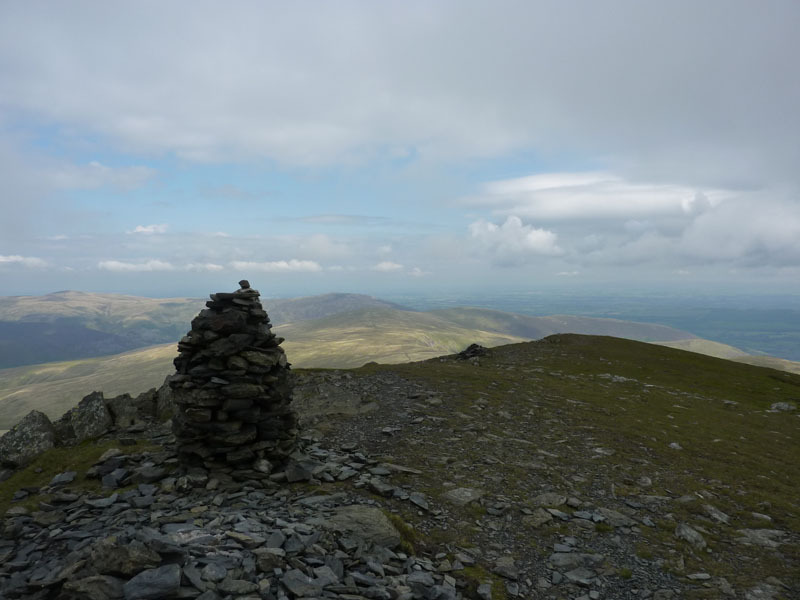 Good Luck, Christine Shepherd, with your target of completing the 214 on Steel Fell. Christine is a contributor on "go4awalk.com". This fell may not be everyone's cup of tea, but recent reports suggest that England is Europe's 2nd most populated nation at around 400 people per square kilometre - so take a break, head for the Common! By the way, this is another fell top I had no intention of visiting today. 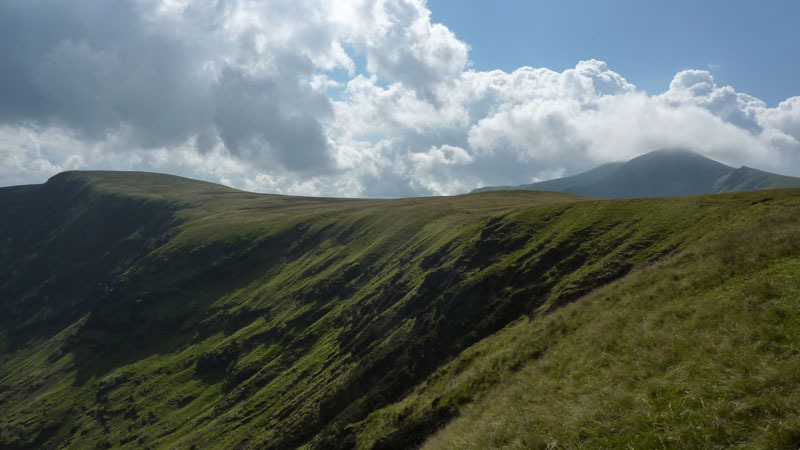 I took a path directly from MC to Bannerdale Crags crossing the col at the base of Atkinson Pike. 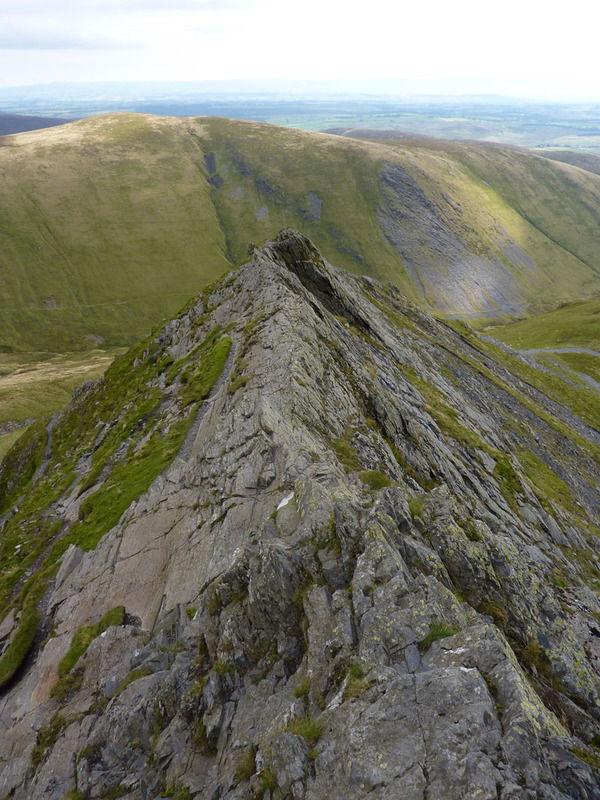 BC summit is just above the crag edge, where I sat for lunch and took this photo towards Bowscale Fell. I'm back on the planned route. Next up was an edge walk to Bowscale Fell, The Tongue - right, out of pic, will have to wait for another day, but it must offer great views. The weather is improving and Sharp Edgers now will be having a great time in the sunshine. There is a shelter behind me. 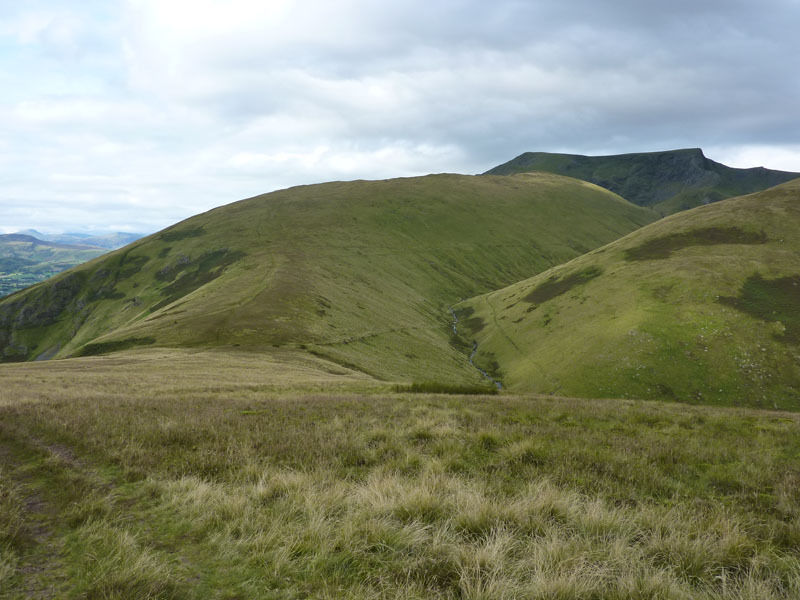 High Pike (l) and Carrock Fell (r) are in view. 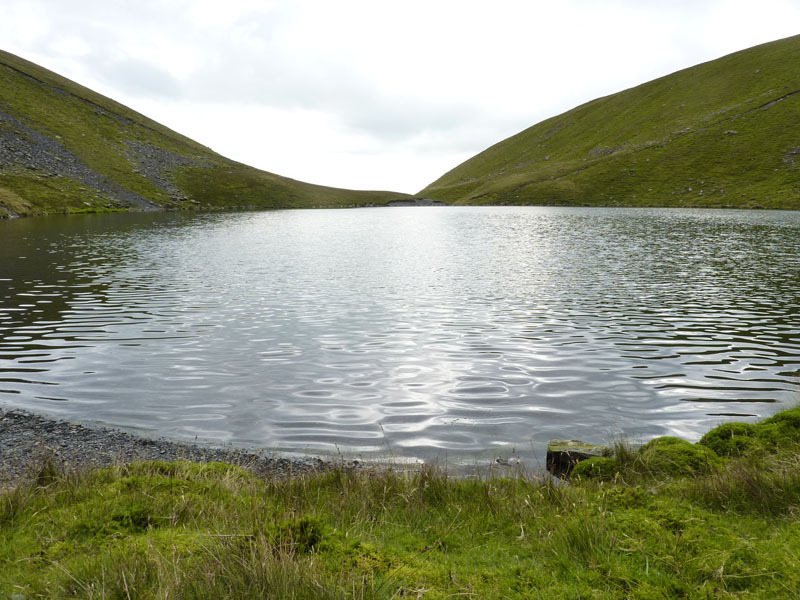 I followed a route off Bowscale Fell that would allow for a look at Bowscale Tarn. I've put one of my red spots at a place where a rock at 45 degrees and a piece of flat grass allow the weary traveller to take a rest and use use the rock as a headrest. And nod off. A really fine spot for 30 minutes R&R. 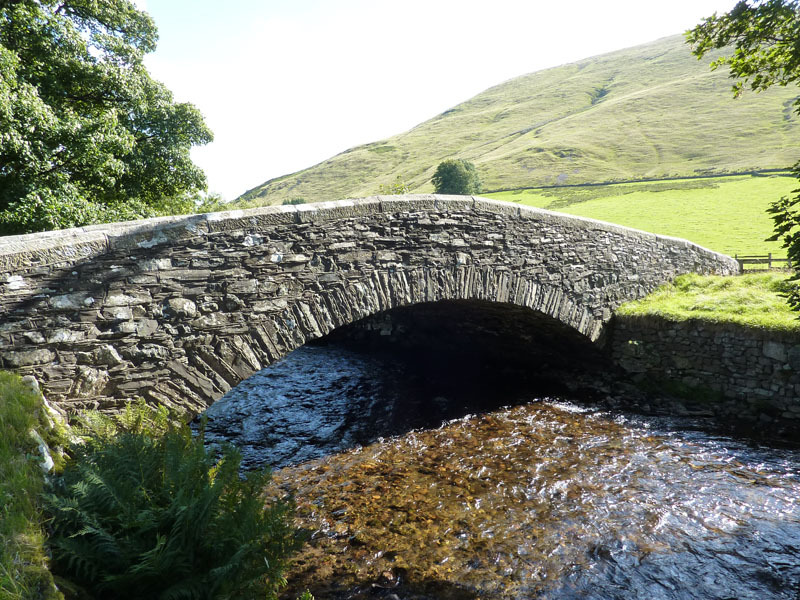 After Bowscale Tarn, I took a direct line to the River Caldew where a footbridge allows for a crossing to the road. This bridge was not there in AW's days, it's not in his book. For that matter, there's nothing to suggest that the bridge is for public use, but nor are there any signs saying "keep off". 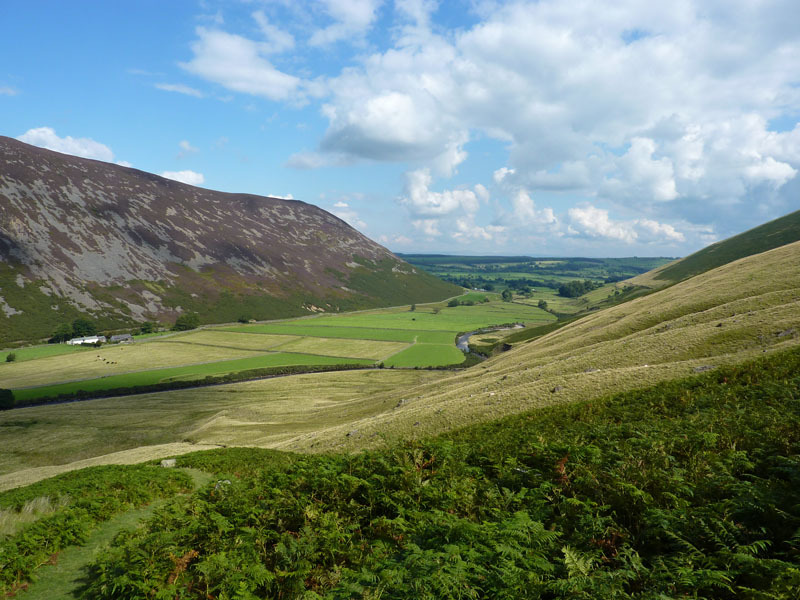 Mosedale, as oppose to Mosedale elsewhere or Moasdale. 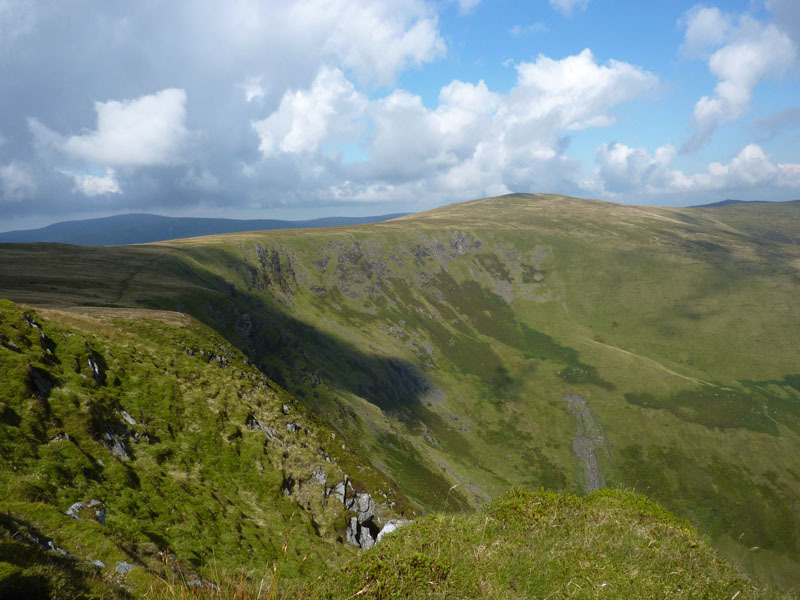 Verdant pastures and a shaggy, heathery texture to Carrock Fell's lower slopes. 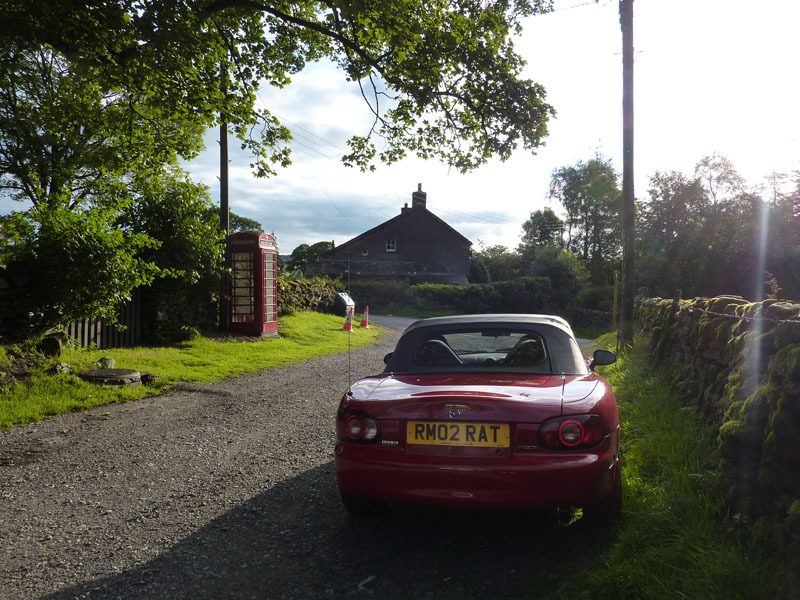 Cuppas in Mosedale - but where? See later.. 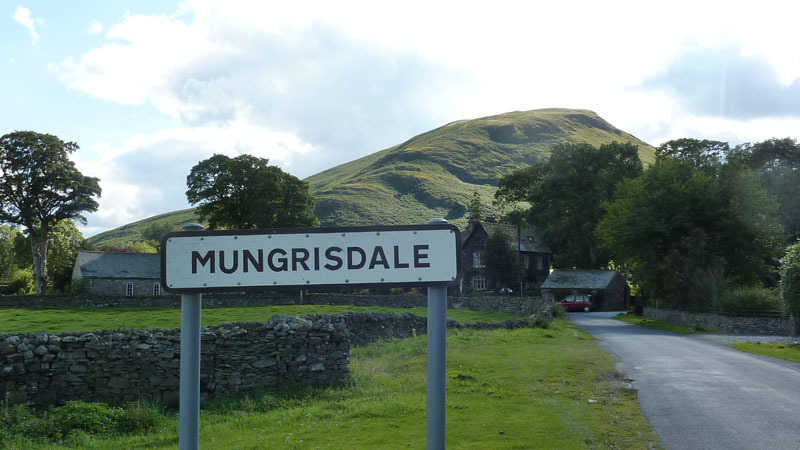 The route back from Mosedale village took me through Bowscale village and along the road to Mungrisdale village. A planned nine mile walk developed into much more. A really enjoyable day out on the Edge and on the edge of the Lake Distirct. Time taken: 7hr 50 mins over a distance of approx. 14 miles. 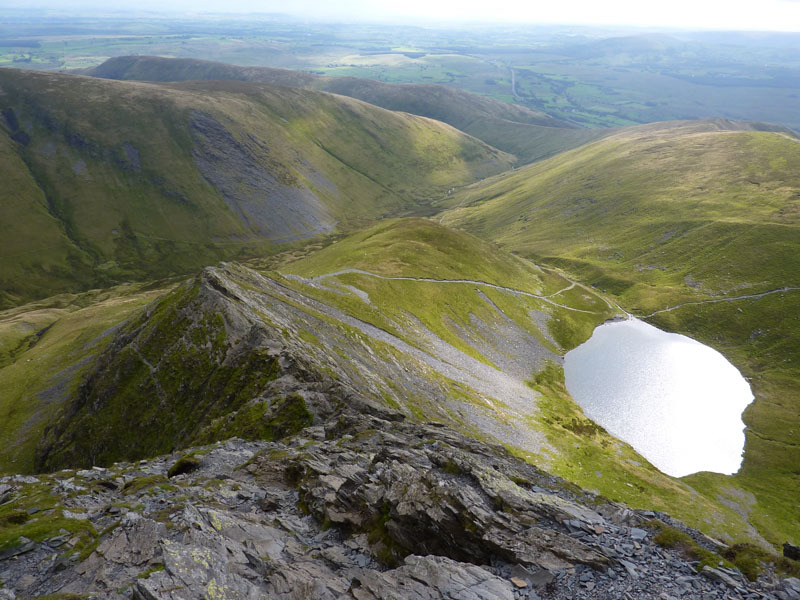 Route: Mungrisdale, Souther Fell, Mousthwaite Combe, Scales Beck, Sharp Edge, Blencathra, Atkinson Pike, Mungrisdale Common, Bannerdale Crags, Bowscale Fell, Bowscale Tarn, River Caldew, Mosedale, road back to Mungrisdale. Weather and conditions: Sunny start, quickly turning grey, but bright and sunny again from midday onwards. Greetings Count: Quality, not quantity. Only serious fellwalkers about today and not too many of them. 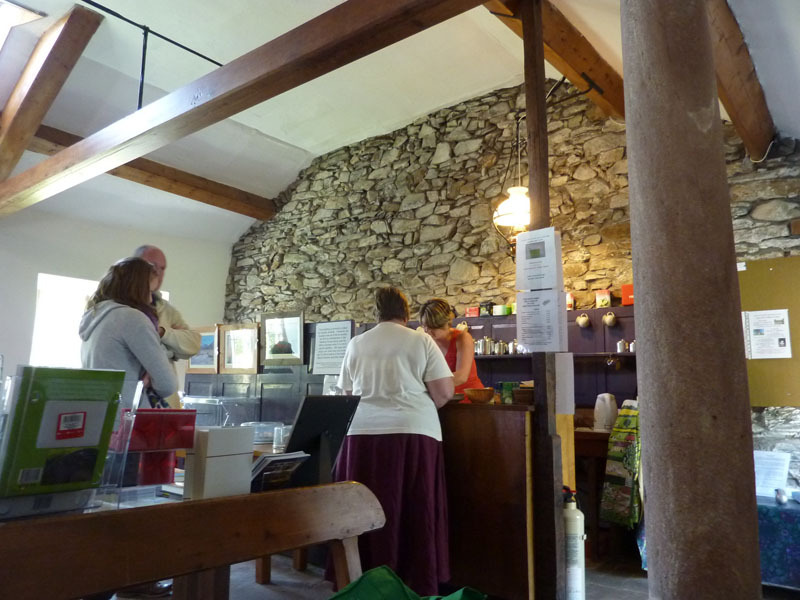 Richard's Refreshment Review: The "Friends Meeting House" in Mosedale opens on Th, Fr, Sat and Sun from 10:30 (or after the service on Sun) to offer a simple menu of drinks and home-made cakes. Very welcome and completely unexpected. 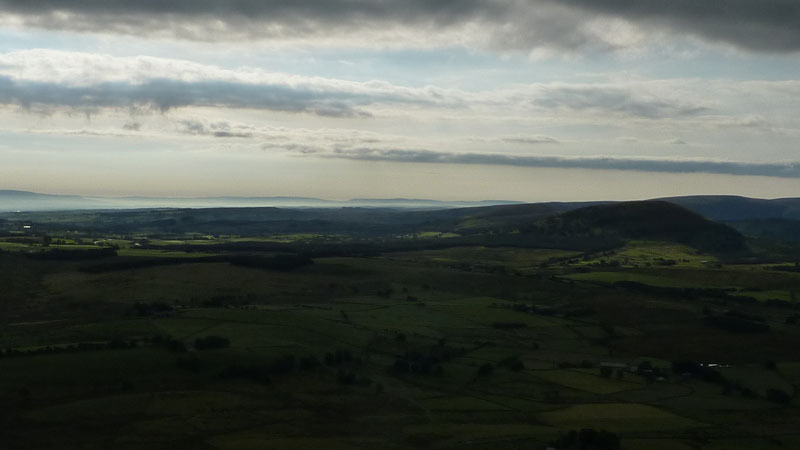 That's a different Mosedale to the one in the report above.